ALBUQUERQUE, N.M. — Native American tradition prevailed during the 32nd annual Gathering of Nations Pow-Wow April 23-25 in Albuquerque, New Mexico, as more than 700 Tribes from the U.S., Canada and Mexico stormed “The Pit” on the University of New Mexico campus. A river of feathers, beads, moccasins and indigenous solidarity signaled the start of the grand entry ceremony. 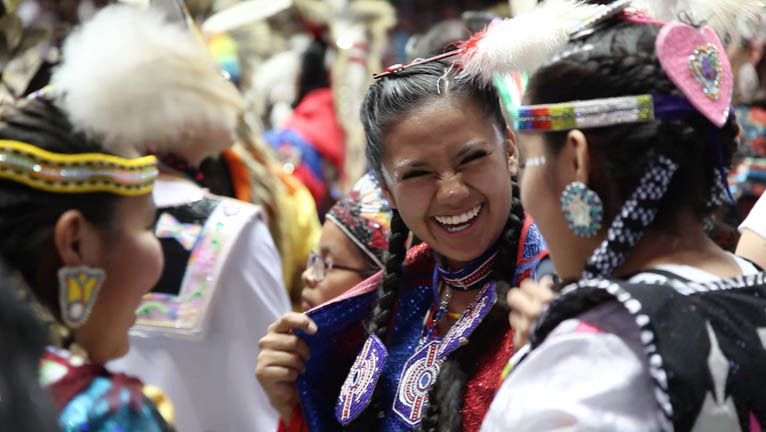 Thousands piled into the arena, dancing in unison, flanked on all corners by drum groups who provided the songs and rhythmic cadence used to bring together 568 Tribes and 220 Canadian First Nations Bands. While the music of The Luna Blues Machine band echoed through the arena on opening day, the stands were filled with pow-wow dancers putting the finishing touches on their regalia. Announcers, guest speakers and musical performers were underscored by the sounds of Jingle dresses being adjusted, bells being fastened to the moccasins of Grass Dance competitors, and the rustling of cloth and feathers as polychromatic head dresses were being adorned atop Fancy Dance competitors. North America’s largest event of its kind featured pow-wow competitions with more than $200,000 in cash and prizes; around 800 Native American vendors offering authentic Indian arts, crafts and jewelry at the Indian Trader’s Market; and dozens of musical performers at Stage 49. In addition, 21 talented Native women took to the stage in the capacity-filled Kiva Auditorium at the Albuquerque Convention Center to compete for the 2015 Miss Indian World crown. Nunez, of the Brighton Reservation, shared the creation story for her talent and answered impromptu questions for the judges. Although she said her schedule was chaotic while attending the pageant, she said it was worth it. Cheyenne Brady, of the Sac and Fox, Cheyenne and Tonkawa Tribes, went on to win the title. She will act as a goodwill ambassador for Native peoples at various gatherings throughout 2015-2016. “I encourage you to go out and share your stories, share your knowledge with all the people around you, especially the younger generations; for our existence as a people, this is all important,” she said to the crowd during the competition. The Native American tradition of honoring past and present veteran warriors was also prevalent throughout the event. A special tribute was paid to Iwo Jima survivor and Navajo Code Talker Thomas H. Begay on the final day of Gathering of Nations. As he greeted the crowd, the 87-year-old veteran, encouraged by the drum beat playing in the background, broke out into dance, which was immediately met with thunderous cheers from the crowd. Seminole Tribe member Stephen Bowers attended the event to solicit support for the American Indian Veterans Memorial Initiative. The Vietnam War veteran is working to raise funds for a permanent exhibit to be built at the Education Center at The Wall near the Vietnam Veterans Memorial in Washington, D.C. The exhibit will highlight the sacrifices of the Native American, Native Alaskan and Pacific Islander military servicemen and women who served their country. During the past 32 years, Gathering of Nations has grown from “an early, simple dream to one of the world’s most recognized annual festivals,” according to its website. The event strives to provide a place where Native people can come together each year to celebrate and share culture and where singers and dancers can feel confident that competition is fair. “This is what it’s all about ladies and gentlemen: coming together as one, as a family,” said Derek Mathews, Gathering of Nations founder, during the final grand entry ceremony April 25.